With the approach of this fall’s Rise of the Rest tour—a startup pitch competition led by AOL co-founder Steve Case and his investment company Revolution—we are looking forward to hosting Case and his team here at the Aspire Ventures offices to showcase the innovative work we’re doing in the region. 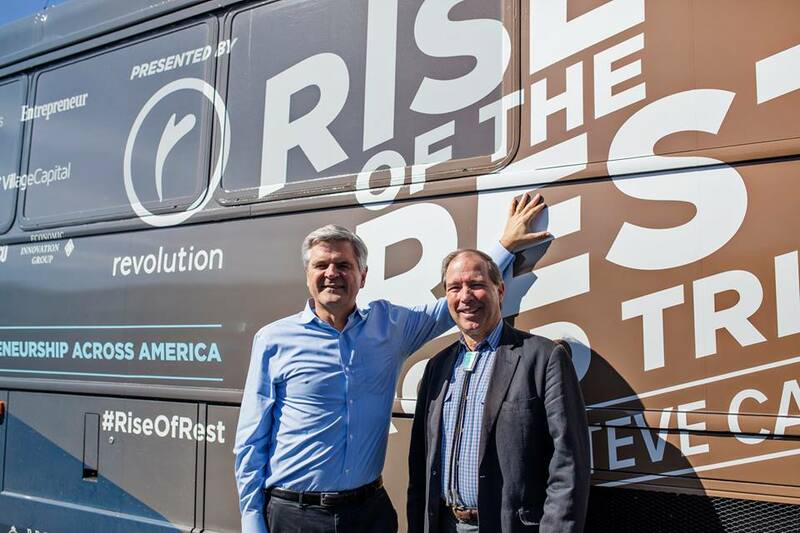 Revolution’s RISE OF THE REST ® with Steve Case is a nationwide effort to work closely with entrepreneurs in emerging startup ecosystems. Their view is that this is the beginning of a new era for entrepreneurship across the U.S. — high-growth companies can now start and scale anywhere, not just in a few coastal cities. They will kick off their national tour this year in Central PA, before heading to Ann Arbor MI, Indianapolis IN, Columbus OH, and Green Bay WI. In Central PA, nine finalists have been announced, four of which hail from our very own city of Lancaster—a testament to our strength as a startup community. On October 10, Case and the Rise of the Rest tour will visit York, Harrisburg, and Lancaster. In Lancaster, Case will visit two locations, one of which is Aspire Ventures—and it’s no wonder, given that we share such similar visions for the future of innovation. In his book “The Third Wave”, Case argues that we’re on the cusp of a new era--that is, the third wave--in which the Internet becomes a “ubiquitous force in the world,” one which is integrated into every aspect of our lives. This new era will be about transforming industries that are heavily regulated and generally resistant to change, such as healthcare, finance, and education. In short, the Third Wave is about making connections between us and literally everything we do. Gone are the days of a lone inventor generating apps in his basement. In this upcoming third wave, partnerships and networks will prove vital to the disruption and transformation of historically change-resistant industries. The Aspire model relies heavily on collaboration. Not only have we recently co-founded the Smart Health Innovation Lab in collaboration with Capital BlueCross, Clio Health, and Lancaster General Health/Penn Medicine, we also employ connectivity within our own internal ecosystem of ventures and projects. We encourage the constant cross-pollination of ideas between our ventures in order to ensure a symbiotic, mutually beneficial system, and all of our ventures utilize a tech pattern that combines cloud computing, sensor integration, mobile capabilities, and our A²I adaptive artificial intelligence platform. This notion of innovation through interconnectedness has recently taken the world by storm, and it’s certainly not limited to Silicon Valley. Startup ecosystems have cropped up all over the country; which is precisely why Case initiated the Rise of the Rest tour--to draw attention to emerging startups in local communities that propagate these qualities of Internet integration. Those of us here at Aspire are excited about the Rise of the Rest tour, because it’s initiating conversations we support, raising public awareness about important issues, and bringing our attention to other startups in our region that are doing some amazing work. In addition to hosting the Lancaster tour stop, we will attend the fireside chat in Harrisburg as well as the pitch competition to get insights from Revolution on what we’re doing right here in Central PA. Our CEO, Essam Abadir, will also be spending some time with Steve Case and his colleagues at Revolution on the Rise of the Rest bus. We’re proud to be a part of this event, as well as the growing technological movement in Central PA. As the innovation ecosystem here continues to grow, we can have a global impact for a better future.